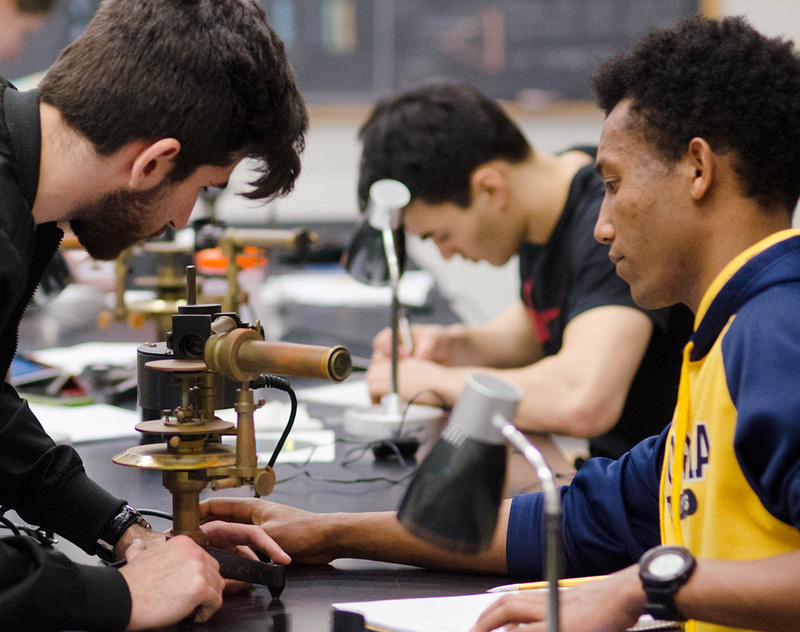 Bowdoin offers students a variety of options for pursuing studies in engineering in addition to their degree in physics. Bowdoin College arranges shared studies programs with the University of Maine at Orono, the School of Engineering and Applied Science of Columbia University, the Thayer School of Engineering at Dartmouth College, and the California Institute of Technology (Caltech). These programs have differing requirements and are completed on different time-scales. See below for details regarding the various available engineering options. Columbia, Caltech, and UMaine 3-2 Programs require that a student complete certain courses at Bowdoin during the first three years of the undergraduate career; students may then apply to transfer to Columbia, Caltech, or UMaine for two years of that institution's engineering program. This step requires the recommendation of the physics department chair and/or the department's 3-2 advisor to ensure that the student is well-prepared and is capable of succeeding in the engineering program. See the Physics Department Handbook for a sample schedule of the three years of study at Bowdoin. Currently, Caltech invites students of superior academic achievement to apply and transfer into their 3-2 program. Determination of acceptance is decided by the Caltech Upperclass Admissions Committee. Admission to Columbia is guaranteed if the student takes the requires Bowdoin courses and maintains a B+ (3.3 GPA) average. Upon successful completion of the two years at the engineering school, the student will receive the Bowdoin Bachelor of Arts degree in physics and a Bachelor of Science degree in engineering from the engineering school. Note that as a transfer student, there is no fixed relationship between the financial aid being received from Bowdoin and any financial aid that may be offered from the engineering school. Students must apply for financial aid from the engineering school. Lastly, students may also apply as regular transfer students after three years at Bowdoin into any nationally recognized engineering program, earning only a degree from that engineering institution. The engineering program with Dartmouth differs from the programs at Columbia, Caltech, and Umaine in that the student completes his/her junior year at Dartmouth as part of the Twelve College Exchange Program. Upon successful completion of the senior year, the student receives the Bowdoin Bachelor of Arts degree in physics. The student may then apply for a fifth year at Dartmouth. Admission to the fifth year at Dartmouth is guaranteed if the student has a C average or better during his or her first year at Dartmouth. Upon successful completion of the fifth year, the student will receive a Bachelor of Science degree in engineering from Dartmouth. Acceptance into the Dartmouth program is highly competitive and is limited to 25 students. Successful applicants normally have at least a B+ (3.3 GPA) average in their mathematics and science courses. If the student is receiving financial aid from Bowdoin, the aid continues to be provided by Bowdoin during the Twelve College Exchange year. In addition to the 3-2 program, Columbia University also offers a 4-2 option. Students who graduate with a Bachelor of Arts degree in physics from Bowdoin can continue at Columbia for 2 years and graduate with a Master of Science degree in engineering from Columbia. Additionally, an Economics course is often desired by the engineering institution. Particular institutions may also expect students to have taken other courses, and any student interested in these programs should contact the department's Engineering Adviser, Gary Miers, to go over these details. It is important for students interested in the engineering programs to start planning early and be prepared to enroll in a rigorous course of study in the sciences and mathematics.